Patients, family members and their caregivers meet on a regular basis to share experiences, make recommendations, and improve ourselves and the community. Committee meetings are held once a month with a bilingual option. Each meeting will include a meal, learning about what is happening in the health centers, leadership training and opportunities to provide feedback on specific initiatives and offer general comments. Your opinions will be confidential and help improve One Community Health. For more information, please contact Alicia Swift, our committee leader, at aswift@onecommunityhealth.org. The Board of Directors is the legal authority for One Community Health. As a member of the Board, a director acts in a position of trust for the community and is responsible for the effective governance of the organization. Meetings are held monthly on the last Tuesday of each month from 5:30 to 7:30 pm, with a monthly commitment of approximately 4-6 hours per month (includes board preparation, board and committee meeting time). In addition, members are required to participate in an annual Board retreat, including attendance at special events. We value board members who, among a number of characteristics, bring integrity, balance, effective communication skills, willingness to be prepared for and involved in our work, and an interest to learning new skills or if they don’t possess them. Serving as a board member has a number of benefits—you can help make a difference and “give back” to your community, build leadership skills, network and work with people of diverse backgrounds, grow decision-making and other managerial skills, and much more. If interested in learning more or applying, please view our recruitment packet or contact One Community Health. Call 541.386.6380. Meet the current board of directors here. 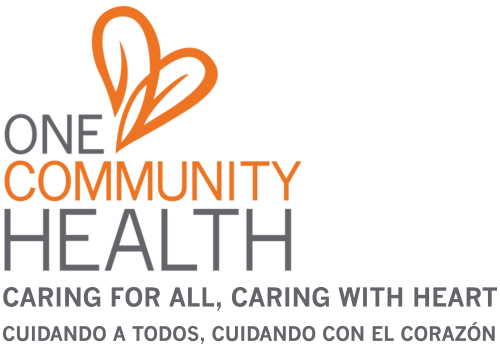 As a 501(c)3 nonprofit organization, One Community Health is always grateful to accept financial donations. Funding typically goes toward general services and outreach, however, you are welcome to specify how you’d like us to apply your contribution. Due to the growing demand for services, we are currently fundraising to build a new and improved building to replace our current Hood River location. All support toward this and any other aspects of our mission—advancing health and social justice for all—is greatly appreciated. Learn about Ways to Give. Or, for more information, call Ronda Snyder, One Community Health’s executive assistant at 541.386.6380. Through the Health Center Advocacy Network, you can support and advance the Health Center Movement to address the needs of health center patients and the communities that federally qualified health centers serve. Currently, health centers serve 27 million patients throughout the United States at 9,800 service delivery locations in every state and territory. Health centers like One Community Health collectively save the health care system $24 billion annually in reduced emergency, hospital and specialty care costs. To learn more about the history of health centers, the role of advocates, and how you can get involved, visit the Health Center Advocacy Network today.